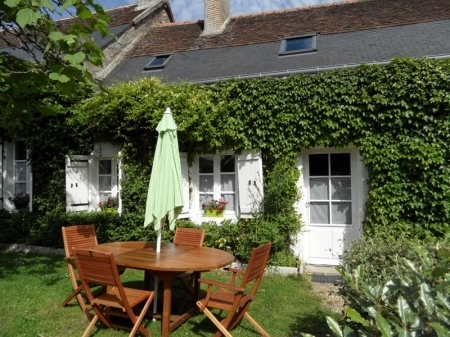 Offering 2 bedroom accommodation, this recently refurbished gîte is ideally suited to the family with one or two children, or for two couples. It has full central heating downstairs, electric heating upstairs and a mobile air-cooling machine. 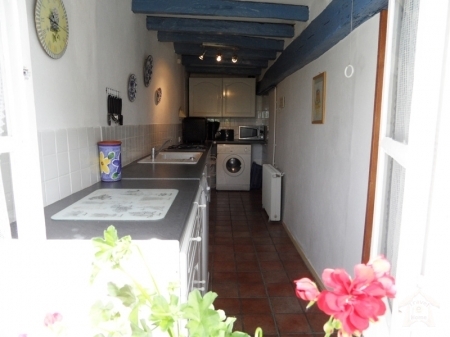 Galley kitchen, fully fitted, with washing machine, dishwasher, gas hob, microwave, small oven etc. There is of course an iron., an ironing board and a clothes airer/drier. Large beamed sitting room with feature fireplace and dining area. Well furnished: For indoor family entertainment there’s a television with English channels, a DVD player with DVDs, a selection of board games and reading material. Bedroom 1: Double bed, large chest of drawers, hanging space and bedside tables. Bedroom 2: Two single beds, wardrobe, chest of drawers and bedside tables. Bathroom with bath/shower with vanity unit. Shower room with vanity unit. Private garden with BBQ leading to the large garden with the 10m x 5m heated swimming pool and outdoor games.